His use of misdirection was so good that he often badly fooled his fellow magicians. 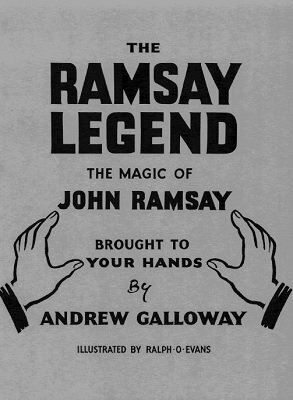 Ramsay was a sleight-of-hand master with coins and thimbles, but worked essentially with all objects including cards, ropes and cups and balls. Lots of clear line drawings by Ralph O. Evans. 1st edition 1969 Goodliffe Publications; 2nd printing 1975 by Magic, Inc., comb-bound, 63 pages; 1st digital edition 2013, 93 pages. Chapter Five: SWITCH IS WHICH? Consider your $15 an investment if you buy this classic! Study, absorb and apply the content and consider your money well spent.